An estimated 150 churches closed since July. December 18, 2013 (Morning Star News) – Christians in southern Colombia are living in constant danger from a guerrilla army that has banned worship services in rural areas under its control. An estimated 150 churches have been forced to close since July, when the 32nd Front of the Revolutionary Armed Forces of Colombia-People’s Army (FARC-EP in Spanish) launched a repressive campaign against Roman Catholic and evangelical churches in the department (state) of Putumayo. The FARC-EP has prohibited celebration of the Mass and Protestant worship in most small town and villages. Only congregations that have express permission from the rebel group are allowed to hold services without fear of retaliation. Christians at greatest risk are the members of house churches and the itinerant evangelists who serve them. 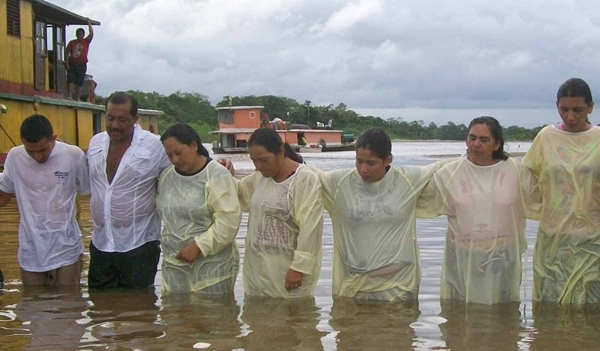 The Pintos have pastored the Church of God in Puerto Asis, Putumayo since 1988. Angel Pinto also serves as itinerant pastor of several newly planted churches in the region. During his 25-year ministry, Pinto has been captured five times by armed groups. Twice they told him he would be executed for violating FARC-imposed bans against preaching. In both cases, local commanders released the pastor once they realized who he was – his congregation operates a well-known rescue ministry for war orphans. The FARC is known to have assassinated hundreds of evangelical church leaders over the years, including some of Pinto’s ministerial colleagues in Puerto Asis. Guerrilla threats have driven six priests from their parishes in the Diocese of Mocoa, according to press reports. “In the manual of coexistence issued by area FARC units, they have ordered us to close our churches, prohibited us from visiting outlying communities, or to preach – in effect, we must cease religious celebrations altogether,” Monsignor Luis Alberto Parra, bishop of Mocoa, told El Colombiano. In the 50 years since the FARC launched its guerrilla war, 220,000 persons have lost their lives, according to a study by Colombia’s National Center for Historical Memory. Hundreds of thousands of families have been displaced by the violence, creating one of the world’s largest populations of internal refugees. Ironically, the current aggression against Christians is happening while the Colombian government is engaged in negotiations with the FARC in Havana, Cuba, with a view to developing a comprehensive peace plan. The Colombian government tapped politicians, journalists, businessmen, and retired police and military officers to form the negotiating team, but no religious leaders. Eneida Herrera, an evangelical and professor of Public Finance at the Autonomous University of the Americas, lamented that the church has suffered violence from armed groups yet was excluded from talks in Havana. On Friday (Dec. 13), the 48th Front of the FARC-EP tried to take by force the village of Caicedo, about 30 minutes from Puerto Asis. In order to stall response from police and military units, guerrillas blew up an oil tanker on the road as Angel Pinto was passing through on his motorcycle. He and other travelers were unhurt but were stranded at the site for several hours until authorities could restore order and remove the burning tanker.